Dan Peyton is not worried about Brexit. 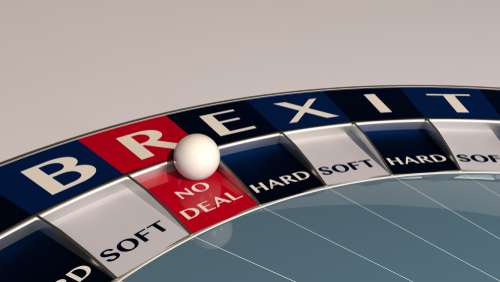 “The risks that Brexit throws up are relatively low,” says Peyton, the managing partner of McGuireWoods’ London office. The firm entered the London market in 2009 through a merger with Grundberg Mocatta Rakison. Peyton says he and most of his colleagues in the small office are English lawyers practicing English law, which mitigates his concerns. Peyton struggles to see how the practice of law in a law firm in London, or in other European cities, will change materially as a result of Brexit—at least in the short term. While Peyton’s office may avoid the stickier aspects of Brexit, other U.S.-based firms in the U.K. and U.K.-based firms operating in Europe are trying to figure out how to operate across the European Union and with European clients in a post-Brexit world. Brexit itself is the culmination of a 2016 referendum where U.K. voters narrowly chose to leave the 28-nation bloc. Since triggering Article 50—the formal process to leave the EU—a two-year clock has been running as the U.K. and the EU negotiate the terms of their divorce. In the U.K., there is a distinct lack of consensus on how to leave. Supercharging uncertainty, the U.K. Parliament and the European Union have yet to agree on Brexit’s terms. In just three consecutive days in March, Parliament voted to reject Prime Minister Theresa May’s negotiated deal with the EU—for a second time. Parliament also voted down the possibility of a no-deal Brexit, which is considered by many as the worst-case scenario that would have the U.K. crash out of the EU without a transition plan. On the third day, a majority of parliamentarians voted to request an extension of the March 29 deadline from the EU. Last week, parliament took control and voted on seven different Brexit options, all of which failed. On Friday, May attempted a third vote on her negotiated plan, which also failed. The EU, for its part, granted a conditional extension until April 12. This uncertainty leaves law firms operating on both sides of the English Channel planning for the worst. Either by choice or deadline, a situation where the U.K. leaves the EU entirely, also called a “hard” Brexit, raises two main issues, according to Carole Symonds, a tax leader for U.S. law firm services at PricewaterhouseCoopers. First, attorneys admitted to the bar in England, Scotland and Wales may not be able to practice in the EU, and, second, the structure of U.K.-based firms may no longer be recognized by EU members. Without a transition plan, attorney-client privilege may no longer apply for communications between attorneys barred in the U.K. and their EU clients on certain EU matters. They will also be unable to practice in front of the European Court of Justice, where matters of European law are litigated. To that end, “people are discovering their Irish grandparents and things like that,” says Tony Williams, the principal at Jomati Consultants in London, who previously led Andersen Legal. Before the referendum, Ireland saw about 50 attorneys from the U.K. join its bar membership each year. Between 2016 and 2018, over 2,000 U.K. attorneys have joined the Irish bar’s ranks, according to the Law Society for Ireland’s magazine, the Gazette. Firms are also considering how they will operate in Europe after Brexit. This is particularly interesting for American firms in London because many used London as a foothold into the EU, says Mickaël Laurans, head of international for the Law Society of England and Wales. Firms in the U.K. that structured as a limited liability partnership have been able to operate in the EU because the U.K. was a member of the bloc. Without a deal, that may no longer be the case. While DLA Piper and Kirkland & Ellis have opened offices in Ireland and France, respectively, others are sticking it out in England. Being that the U.K. makes up about 20 percent of the European legal market, according to a 2015 report from the Law Society of England and Wales, EU member states are also trying to mitigate the potential damage from a “hard” Brexit—or capitalize on its uncertainty. Realizing that the Parisian legal market is bolstered by Anglo firms, the French government passed a law in February that, in the case of a hard Brexit, would grandfather in existing U.K. LLPs operating in the country. In Ireland, which would be the largest common law country in the EU post-Brexit, its Law Society is positioning the country “as a leading centre globally for international legal services.” Seeing an opportunity, this position became official government policy in January. With so much up in the air, every step taken by attorneys, countries and firms is largely an informed bet that may mitigate the uncertainty posed by a hard Brexit.